The Last Book Event of the Year….. | Which me am I today? The Last Book Event of the Year….. 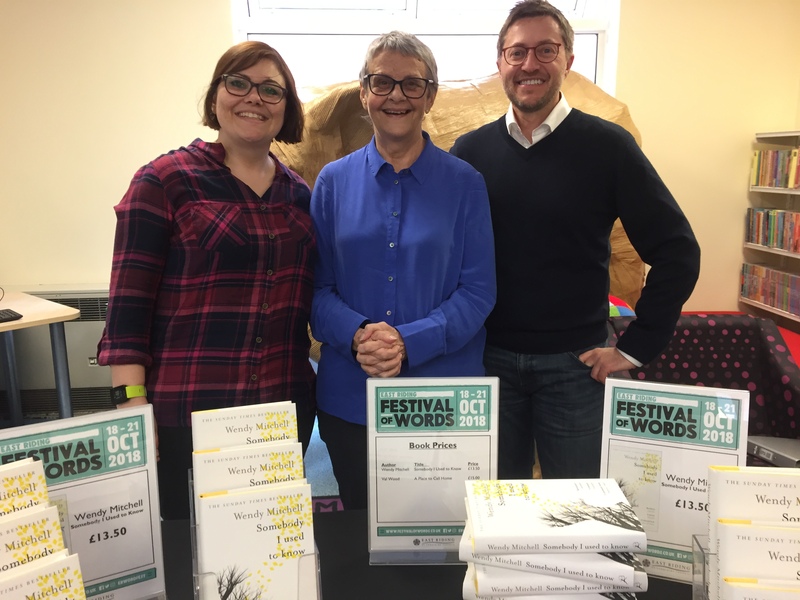 It was the opening event to their Festival of Words so I imagine nerves were jangling but I arrived at the venue and was immediately shown into the children’s library where the event would take place. They were still getting ready but people were already standing outside waiting to come in…..
Because it was local it was wonderful that Sarah was able to come along as it was her day off. Stuart, Gemmas partner, also planned his days so that he could come too. Sadly Gemma had to be at work. I chatted happily with the organisers and a couple of men got the cameras ready as they were also filming the event. They wanted to film me afterwards too answering 3 short questions……. Anyway, as I was mid cuppa, the audience began to arrive and happily waved and chatted to me so I could finish my tea. Because it was in the children’s library, it was a lovely setting as it was so bright and colourful! I could have spent ages scanning the book shelves. 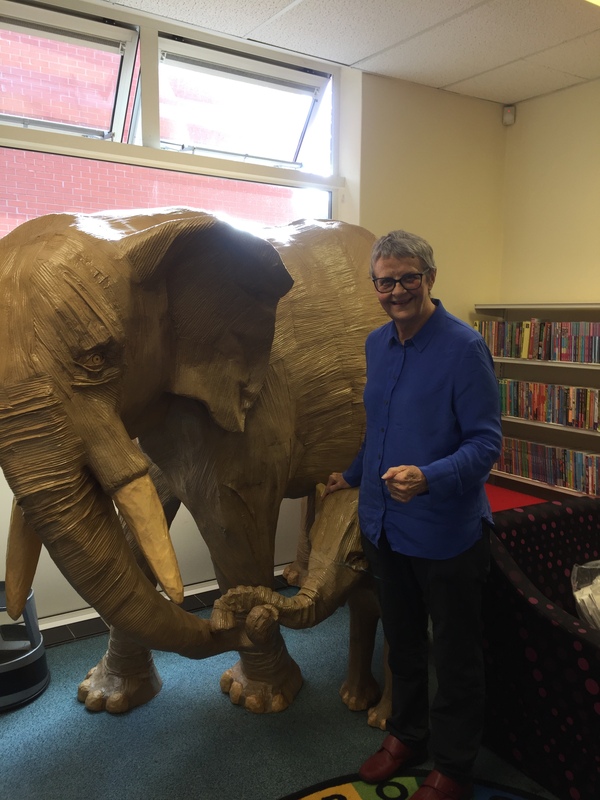 And they had a wonderful elephant and baby….. I finished by reading the Billy extract from my book to end on something humerous…..they were warm in their applause and questions and many queued up to speak to me afterwards and have their book signed. There were some people living with dementia along with their partners and each came to say hello. One man, whose wife was now in a care home, came over and said how, they’d never been ones to talk about it, but after hearing me, he was going to try and hoped it wasn’t too late……One chappie brought me 2 poems and I said I would put them on my blog soon as guest poems. People who read my blog and Twitter friends also appeared – so wonderful. What a way to end a crazy few wonderful weeks. I can now have a few days chilling and writing in silence…..
“What’s your favourite word”……..I said I didn’t have one but four……. 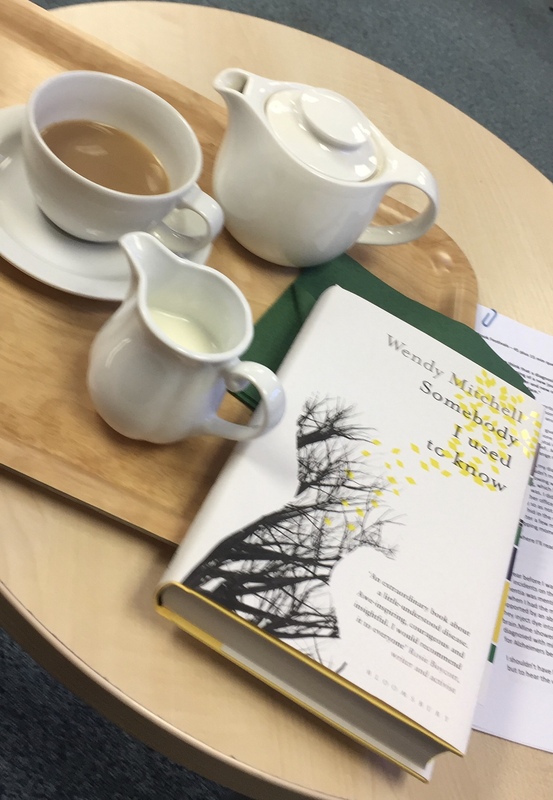 Wendy – you are such an inspiration. I have so enjoyed reading about your jaunts around the country which you recount with such humour. Enjoy your rest, although I am sure you will be keeping busy in less tiring ways. How wonderful! I love your 4 words, perfect! Hello Wendy. I’m Thai PhD student who was talking to you at the end of your speaking. Yesterday event was very nice for me and it is very good to listen to your experiences and your perspectives on dementia. It is very useful for me and my PhD research as I know that the culture from each country can have an effect on the care need of persons with dementia but you also mentioned that each person has an individual need, which is very true and it is very important to be concerned. Thank you for your wonderful perspectives. children and look forward to reading more on this subject. Just found your blog and look forward to reading it. So glad the event went well…… and the venue so beautifully timed. Super, well done! Wendy, So pleased to have met you,. So sorry my husband, who has Alzheimer’s, was having a “ bad day “ and on “The Day” could not have coped. Fortunately my sister was here and was able to take him home, and allow me hear you speak. He would have benefited so much from hearing you speak. You have a gift being able to communicate and “ground” the ”feelings so many people diagnosed feel, but are unable to express” . I know some of what you said would have, for a short time, given him “ comfort” – if that is the right word. Thank you and enjoy your “vacation (? )” with your family. And hope you are having a rest!! Your two daughters are quite right, – I suspect they are trying to get you to slow down! !, Spend some time for yourself and them. You do not appreciate how much you have already done to challenge people’s concept/ reality of Dementia. Can you do more?